Our latest trip to Austria is a simple story to tell. We gathered friends and family we love and miss and went skiing in the sun. No gnarly ski lines or deep pow to brag about, just cherished time spent with great people. Sankt Johann in Tyrol would be our home for a week of skiing the Tyrolian Alps. Our buried two-story abode was proof enough of the plentiful snow thus far, and with a forecast of blue skies and sun, we knew life was going to be good. I think it's safe to call Tyrol a ski mecca. The vast amounts of terrain connected by a lift system that seemingly reaches across the region easily put this area above most. We skied Kitzbuhel, Feiberbrunn, Kitz Horn, Sankt Johann, Saalbach, Hinterglemm and still didn't even scratch the surface of what can be skied. Just make sure you have the right pass and don't miss last chair. 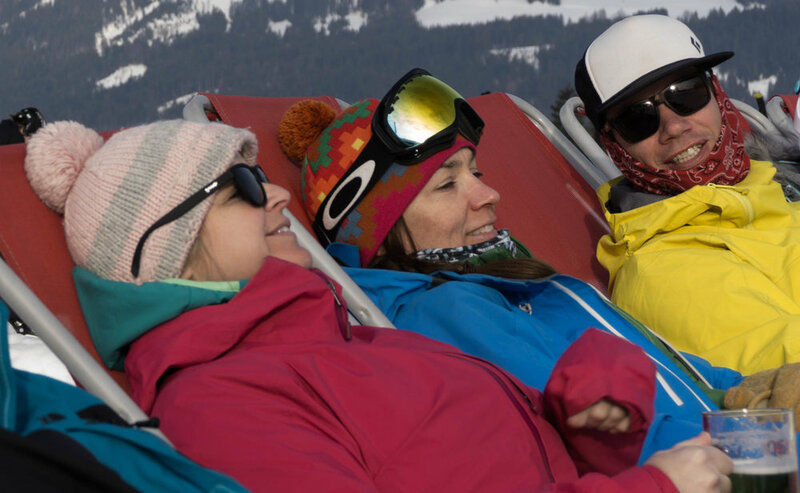 Do you know what else can bring a group closer together besides skiing? The fear of death. There is a pastime in Austria called Rodeling that at first look can seem harmless and innocent. Don't be fooled. The Austrians make it look easy. But if you like to cheat death by careening down a hill on a tiny sled with no way to stop, then please, be my guest. Just take a change of underwear. We gave it a try on our last evening, and after the first run, the only thing that got me back on the chairlift was the one free beer at the top. Proceed with caution. Building these memories in the mountains with our best friends is what seems the most important for us these days. Being surrounded by positivity and warmth from good people recharges our soul and gets us through to our next adventure. We'd never get through the hard days if we didn't have these awesome experiences to look forward to. We love you all!! !